International Indigenous Research Conference at the University of Auckland. The research conference brought together Indigenous researchers and scholars from around the world to share experiences, research methods and study outcomes on issues which affect Indigenous people across the globe. 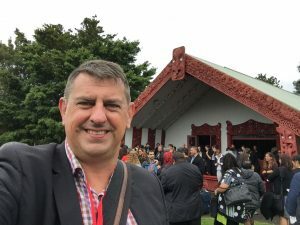 Maori culture and ceremony were a feature and highlight of the four day event, of which Maori and other Indigenous concepts of ‘human flourishing’ was a key theme. Interestingly, one international keynote speaker, Sir Mason Durie, cited the imprisonment rate of Australia’s Aboriginal people as an example of how ‘too many of our people are languishing’. Scott presented FPDN’s research program which involves collecting narratives from Aboriginal and Torres Strait Islander people with a lived experience of disability. It covered the broad historical and social explanations of why disability amongst Aboriginal and Torres Strait Islander people is under-reported in data and research, and hence negated in public disability policy, and addressed the forces of intersectional discrimination which holds back the potential for a person who is both Indigenous and has disability. The presentation then looked at the inclusive methods used in the research, and that in reaching out to obtain the voices of people who have been historically marginalised in public commentary is in itself a form of healing and reconciliation, which in turn could form a foundation for the flourishing of First Peoples with disability community – consistent with a key theme of the Conference. A special thank you to the Lowitja Institute for their research support grant which enables Scott to present and participate in learning experiences such as these.